Update: This page is an update on our blog post of 5 March 2018, in which we took a look at the share price performance of various food producers listed on the JSE such as RCL Foods, the owner of Rainbow Chickens Limited and TigerBrands (which owns Enterprise) and Pioneer Foods group (whose companies are not implicated in the Listeriosis outbreak. So how has these companies share prices performed since the announcement by government on the Listeriosis outbreak and the source of the outbreak? The interactive graphics shows the share price performance over the last 3 years for Pioneer Foods (PFG), RCL Foods and that of TigerBrands (TBS). The graphic shows the performance of TigerBrands, and as soon as a user clicks on the other shares it shows the share price return for the shares selcted for the period seleccted. As the user changes the dates the graphic recalculates the returns of all the shares selected. Below the graphic we provide a brief summary of the main goods produced by the three food manufacturers selected in this graphic. The image below shows the 1 month share price returns of Tiger Brands, Pioneer Foods and RCL foods. Tiger Brands are down by -21.6% for the last month, while RCL foods showed an increase of 6.06% and Pioneer Foods showed a moderate decline of -8.9% in its share price. But we suspect RCL foods will get a hammering today as it was confirmed that Listeriosis was found at one of their factories. Expect that gains made by RCL over the last month to be wiped out pretty soon. According to Tiger Brands website they are "A Top 40 JSE Limited company whose footprint extends across the African continent and beyond, is one of the largest manufacturers and marketers of FMCG products in Southern Africa, and has been for several decades. 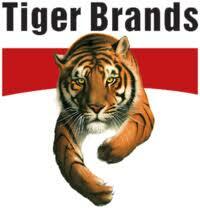 Tiger Brands has been built over many decades through the acquisition and clustering of businesses. Our strategy for success comes from the perpetual renovation and innovation of our brands, while our approach to expansion, acquisitions and joint ventures has given traction to a distribution network that now spans more than 22 African countries. Our group focus is on the core business of FMCG categories that spread across the value chain. Our wide range of brands are underpinned by comprehensive research and meaningful insights into each of the markets in which Tiger Brands operates. Tiger Brands is a world–class operation – and will continue to hold and grow its position through constant investment in every asset of the business, be it in people, brands, technology, efficiency, quality or sustainability."